Apple Inc. has been listed as a 2017 exhibitor at Mobile World Congress, which is an oddity given the company's trade show presence has been virtually nonexistent since the company's final appearance at Macworld in 2009. If the listing is accurate, it would mark Apple's first time attending Mobile World Congress, the world's largest exhibition and conference for the mobile industry. MWC 2017 runs between February 27, 2017 and March 2, 2017. Babel PR pointed us towards Apple's exhibitor listing, which shows the company has booked space in the App Planet in Hall 8.1, as well as two spaces in the upper level that runs above Hall 2 in the Fira Gran Via Conference Centre. App Planet is described as "a unique area focusing on the latest technology from the fast-moving apps industry," so Apple's presence could be related to promoting the App Store ecosystem or Planet of the Apps. Apple's other upper level spaces appear to be meeting rooms, suggesting the company's presence may not be public facing. This would be unsurprising, given Apple has shifted new product announcements to its own media events. Apple steadily stopped attending trade shows in the late 2000s, including the NAB Show, Macworld, and Apple Expo in Paris, and it has regularly passed on attending CES, the largest consumer electronics show, in Las Vegas. In announcing its departure from Macworld, Apple said trade shows have become a very minor part of how it reaches its customers. 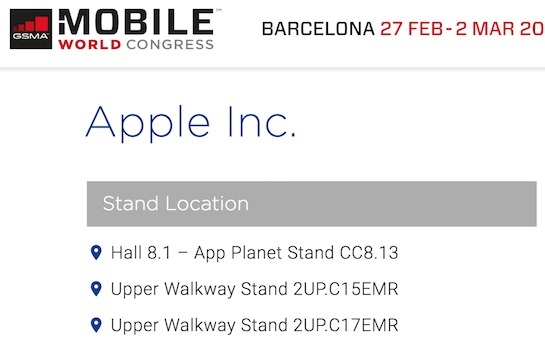 For that reason, Apple's public presence at Mobile World Congress is questionable, although still plausible. Should we receive confirmation about Apple's presence at Mobile World Congress, we will update this article accordingly. Update: Shortly after we published this article, Apple was removed from the list of exhibitors. Update 2: Apple told Babel PR it does "not have an official presence at the show," while the show's organizer GSMA told The Mobile Network it can "confirm that Apple will have meeting space at Mobile World Congress, as they have had previously." Perfect place to launch new Watchbands..
Exec #1: Guys - we're not hitting previous numbers, how do we get more customers!? Exec #2: Who is this idiot? What's old is new again, let's go back to the conventions! Eventually even the most successful of companies do have to get off their complacent backsides and champion for more business. It's a desperate move something they should have been doing from the beginning. They feel the heat and pressure from competitors and probably won't have something new to show. This is a bad sign. I remember why they left several years ago. Basically, they didn't need to attend because their sales momentum was so robust. iPhone SE 2................? Would be a similar time of the year to when the SE was announced earlier this year. And Apple did that because trade show presence has no added value for such a major company. In the ol' days (before everyone had internet), trade shows gave you an opportunity to show-off your stuff and generally have a nice week.